ShortScale :: View topic - Any info on this Squier bass? Posted: Mon Aug 10, 2015 8:02 pm Post subject: Any info on this Squier bass? 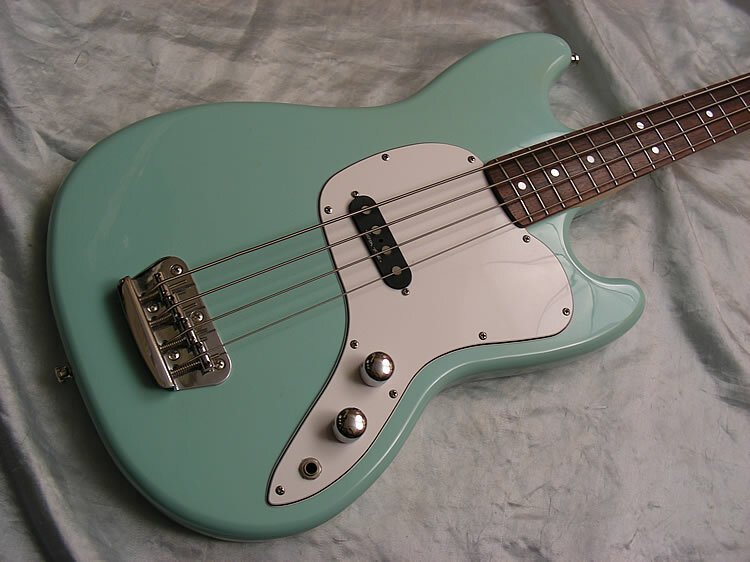 Alright, so I recently bought a Squier Bronco bass out of a pawn shop for $60, but after doing some research on it, the bass has me bewildered. The neck is a Squier bronco bass neck, but has P Bass style tuners, not the modern squier oval style. I removed one of the tuners to see if they bad been upgraded, but saw no sign of earlier tuner installation. 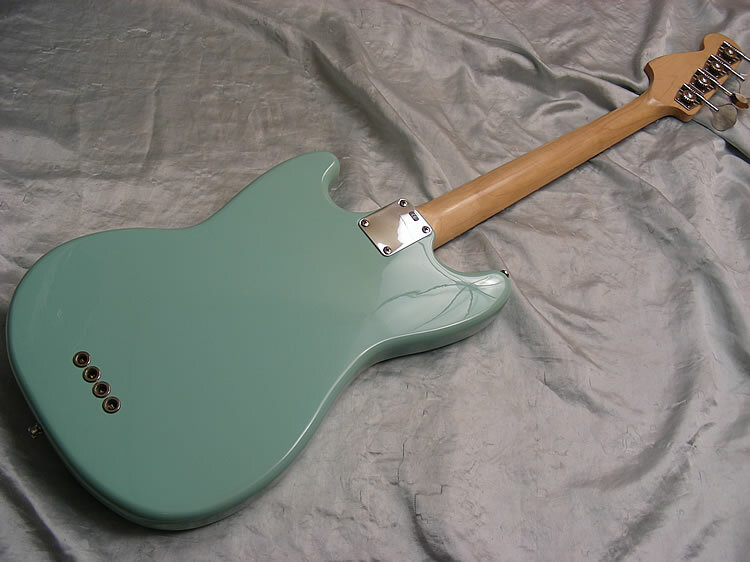 This particular Bronco also sports a surf green body, a color of which modern bronco basses aren't produced in, but the Squier Vista Musicmasters were. It also has what I think is a custom cut pickguard that looks sort of halfway between a Bronco bass and a Squier Vista Musicmaster Bass. The color looks to be original and not a repaint, but the neck is a maple bronco. First question: can someone tell me if the Vista Musicmaster Basses came standard with string thru bodies? That may help me further identify my instrument. Second question: Is it possible that someone replaced the original neck and pickguard on a Squier Vista MM bass? Last question: Just what in the heck is this bass? Looks like a Vista Musicmaster body with an Affinity Bronco neck/other bits on it to me. Looking under the guard could prove quite useful, if the finish is indeed original you should be able to see the original pickguard's holes. As far as would this happen, sure... Squiers are parted out and sold separately all the time and while the Vistas are more desirable, not everybody who bought one back in the '90s realizes this. Did the Vista Musicmasters come standard with string thru bodies? Reason I ask is that mine isn't. Another reason I'm a little confused about what it is. Yeah... that's weird. The Vista MMs were indeed string-thru. Maybe it's just a refin and a funky guard on a Bronco, or a different kind of MM body with Squier Bronco bits on it. Here's a Pic of the Body rout. It doesn't look like either the Bronco or the Musicmaster Bass rout. Maybe it's guitar body? Its a Musicmaster body with a Bronco neck. I have a Musicmaster in black and had a Bronco just before. The Musicmasters are great, the only thing thought okay about the Bronco was the neck funny enough, not as chunky as the MM. Posted: Thu Aug 20, 2015 10:15 pm Post subject: Re: Any info on this Squier bass? Posted: Sat Sep 12, 2015 3:03 am Post subject: Re: Any info on this Squier bass? Thanks! I love it! It's definitely one of the most fun basses I've ever played. I just ordered a Sentell, I'll post pics of the new setup once I get it installed.